Central Michigan University Professor Michael Garver’s marketing research students ponder a question projected on a screen in front of the room. With a tap on a hand-held electronic device, each silently logs an answer. Garver calls out “team up!” and the room bursts into action. Students huddle in groups of four to consider the question together. Conversation buzzes. Students bounce ideas off each other working together on the problem. A few minutes later, Garver calls time and each student answers again. The results? Initially 44 percent got it right. After discussion 80 percent. In active learning, students are engaged with each other, guided by formative assessment, and do hands-on projects to understand and interpret the material instead of just turning all eyes to the lectern. When lecture is used, it is in small and strategic doses. In some classes, there might be no lecture at all. 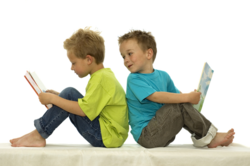 Students read or watch video lessons on their own outside of class and apply their knowledge when they get together – an approach often called a flipped classroom. Mueller has used active learning for three years now, after two years of planning the transition. She said she’ll never go back. Her students prepare ahead of time to team up on worksheets in the class. Even without lectures, Mueller makes sure they come away with the knowledge they need. “There’s plenty that I do; they just don’t see it,” she says. While the setting can play a role, you are limited only by your ingenuity. 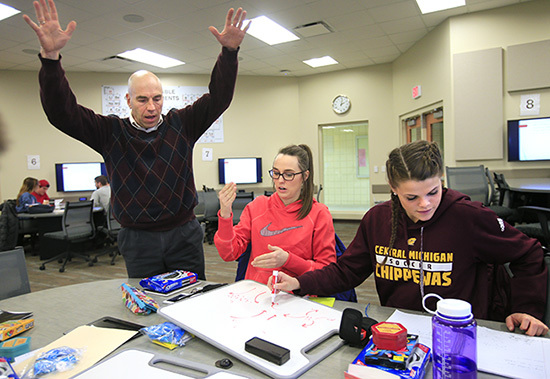 At CMU there are seven active learning classrooms across campus with small group seating and big-time technology. Students sit at group tables, each with their own screen to complete the work. They are talking, finding solutions and interacting with each other and the material. There are ways to make it work in any space. Active learning is about getting students engaged in the learning process, as opposed to transferring information to students in a traditional lecture. Move around the classroom. Put the chairs in group circles. Encourage hands-on projects and conversation. Teachers get immediate feedback, too, as students comment on how much they liked the different activities and how much more they understood from getting actively involved in their learning. If you’re ready to go active, remember you don’t have to dive in headfirst. Instructors use active learning from 10 minutes here and there a few times a week to 100 percent. One thing is always an option: Try something new this week. This sponsored content was provided by Central Michigan University. Central Michigan University has a wide variety of master’s programs for educators taught online and designed for working teachers. Whether you want to deepen your skills, learn new techniques or move into administration, CMU has a master’s program for you.